I turned 40 in August 2012. Like many, I did a lot of introspective soul searching. What have I accomplished? What regrets did I have? Why haven’t I won the lottery? After a quick life assessment, I concluded that I am living a blessed life, but I needed to focus more on the positive, happy moments and marinate in the joy of that feeling and less on the negative things that consume me. I don’t want negative energy, people or experiences to rent space in my head anymore. Our lives are driven by deadlines filled with stress from the job, family dramas and the daily grind. What would happen if we made a conscious shift to be driven by purpose and passion, or for a year to be consciously happy? To be open to the idea that good things are meant for us all? As each of my dear friends sat and wondered if I had drunk too much wine, I began to explain the purpose of this gift. My wish for those who sat the table and for my next 40 years of life was very simple. Be happy. “The goal for 2013 is to fill the jar with notes of happiness,” I said. “Every simple joy that makes you laugh or make you want to relive in your head over and over again, write it down and put it in the jar. How often when we have a cycle of good moments entering our lives do we start to get that little voice in the back of our head, “This isn’t going to last”? Why can’t we just live in the thought that this was meant for us? Why should we feel guilty or more importantly, doubt that happiness was meant to be flourishing in our lives? My jar is filling with simple notes and items: A Safeway supermarket receipt where I got killer savings after using my coupons; a compliment during a date, and movie receipts that bring memories of spending time with friends I love. My hope is that your jar will overflow by the end of the year. Happiness is a choice. Choose to be happy. 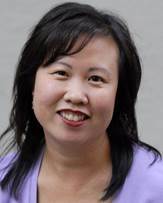 Kathy Chow is the Executive Director of the Asian American Journalists Association (AAJA). Prior to becoming the Executive Director for AAJA, Kathy was the Director of Hands On Sacramento, a volunteer action center that provides volunteer opportunities in three counties. She often is requested to speak and consult with companies on multicultural marketing, building and engaging a diverse workforce, and how to develop your personal brand. Kathy is certified by the Newspaper Association of America as a Diversity Facilitator, and has served on the advisory council for the National Corporate Volunteer Council and the National Hands On Schools Council for Hands On Network & Points of Light Institute.